At about 1:40 p.m., two Rancho Cordova police officers responded to a report of altercation at a business in Ranch Cordova, which contracts with the Sacramento County Sheriff’s Department. The initial 911 call provided no indication that the suspect was armed or dangerous, according to the sheriff’s department. When the officers arrived at the scene, the suspect fired at them and the officers returned fire. After the initial shootout, the suspect fled by foot. At a second scene, the suspect engaged in another shootout with other deputies. There, he shot two officers before being taken into custody. Julie Robertson, 28, was shot in the arm and is in stable condition. Mark Stasyuk, 27, was pronounced dead shortly after arriving at the hospital. 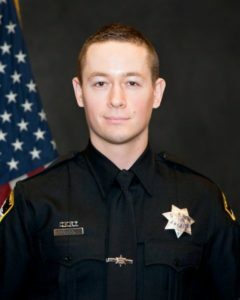 Stasyuk was a four-and-a-half-year veteran of the Sacramento County Sheriff’s Department who was assigned to the Rancho Cordova Police Department as a patrol officer. Stasyuk leaves behind a wife, mother, father and sister. Additionally, a bystander was shot, presumably by the suspect, according to the sheriff’s department. The bystander appears to be in stable condition. The suspect was transported to the hospital in stable condition. Detectives with the Sheriff’s Homicide Bureau, as well as the Professional Standards Division, are investigating the shooting. The Sacramento County District Attorney’s Office will conduct an independent review of the shooting. Meanwhile, in accordance with policies, the sheriff’s department has placed the deputies involved in the shooting on paid administrative leaving pending the investigation.